The Australian government says it wants new laws to force tech firms such as Apple and Facebook to provide access to encrypted messages. Some apps such as WhatsApp use end-to-end encryption, making messages unreadable if intercepted. 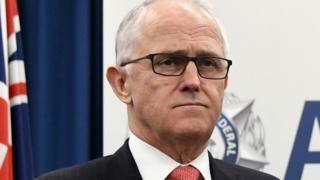 Australia's Prime Minister Malcolm Turnbull has warned that encrypted messaging apps could be used by criminals and terrorists. But security experts say strong encryption protects citizens' privacy. Many countries, including Australia, have laws in place that can force messaging services to hand over a suspect's communications to police with an appropriate warrant. However, messaging companies cannot hand over messages that have been end-to-end encrypted because they do not receive a legible copy. This encryption means ordinary citizens' messages cannot be intercepted by criminals or spies as they travel across the internet. But some people worry that terrorists and criminals can communicate secretly this way. "I think most people agree that there is a problem," said Prof Alan Woodward, a computer scientist at Surrey University. "The trouble is trying to force companies to decrypt via legislation is the very reason end-to-end encryption was introduced - particularly by US-based firms post-Snowden - to give their global customer base confidence that no government could get them to do what the Australians now propose." Mr Turnbull said encryption meant online messages were "effectively dark to the reach of the law", which he said was "not acceptable". He said companies had to "assist the rule of law" and provide law enforcement with access to encrypted messages. Mr Turnbull said he was not seeking a "back door" and wanted communications handed over in "the usual way that applies in the offline world". Prof Woodward said modern encryption methods had not been cracked. But Mr Turnbull said Australian law would prevail over the laws of mathematics. He told journalists: "The laws of mathematics are very commendable, but the only law that applies in Australia is the law of Australia."